I KNOW RIGHT?! You know what's been missing from gin all this time? Not a lime. Definitely not a lemon. Neither a cucumber. Nor tonic water, a glass, or additional cocktail ingredients. A worm. A big old English-bred, southern England worm. I have absolutely no idea why someone would choose to add a worm to a bottle of gin, and can only assume that Mother Ruin was having a nice read of Just William and didn't pay sufficient attention to the fact that she cross-bred with a book about mucky children mucking around. I'd be intrigued to try this just to see if it's a good gin with an eccentric cherry on top or an overpriced (it's 25cl! What the?!) bad gin that's shoved in an admittedly gorgeous bottle and a worm. Apparently the worm adds to the flavour of the gin, much in the same way as it does tequila, but to that I must ask: "What about juniper? Or a secret blend of 13 herbs and spices? Or the Radox herbs?" Still, I adore the addendum under the item description: "Mothers ruin isn’t as depressing as you’d think. Honest. It’s the thinking woman’s vodka." 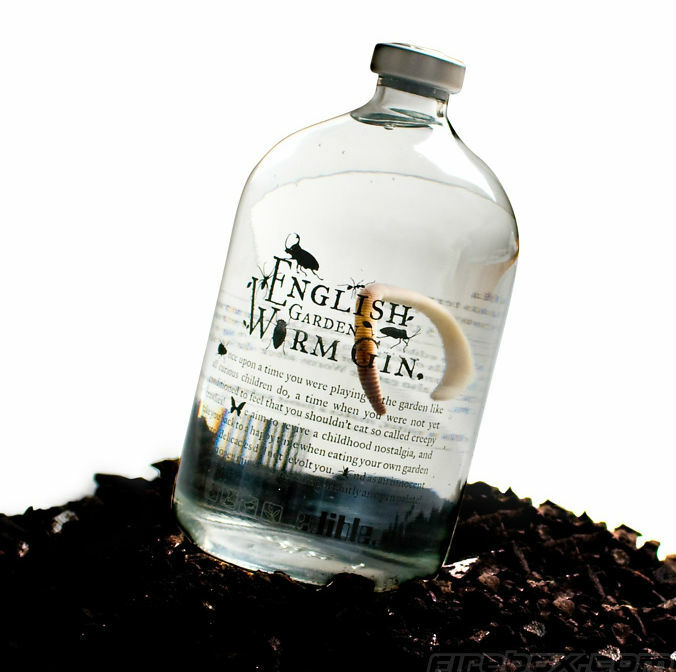 English Garden Worm Gin is £19.99 on Firebox and answers, resoundingly so I think, the eternal question: what do you get for the person who has everything? BONUS: If the gin has massively creeped you out, enjoy this story of how to deal with rude passengers on the bus. Amazing. *pushes glasses up nose* I believe the worm in tequilla is meant as proof that it's alcoholic and not to add flavour. This was due to horrendous watered down tequilla flooding the market during the Depression, according to some cocktail expert who gave me a class once. The worm just proved it was whatever-proof; as long as it hadn't rotted, you knew there was alcohol there. Given consumer laws on packaging claims these days, I'm not sure what the rationale is! But it looks nifty. I like FACTS and I like alcohol therefore I doubly like this comment Helen! The bus story however? Just made bf stop his film to be read that nugget of amazing! I guess the worms die happy at least. It is a lush looking bottle though. Will keep an eye out for a chance to try it. Helen that is a SUPER fact! Adore! And yes, it's a gorgeous story (bus story) and the bottle is brilliant. £19.99 for 25cl? I think I'd eat the worm to get my money's worth. I just don't know how I feel about the earthworm in my gin. It's novel, but if it doesn't add anything to the flavor. And sort of makes me (and others surely) take pause and say "do I want to drink something that has a worm in it..." can it really last? I'd love to hear more if you'e able to try some! This isn't about gin, it's about buses. Watch it all the way through, and be AMAZED.